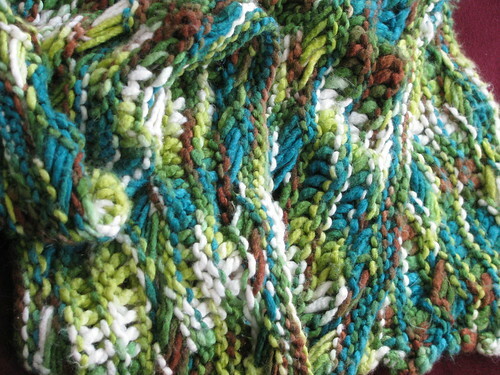 I wanted to make quick use of the Three Irish Girls Aiden that I had picked up at the Homespun Yarn Party. I hunted through my one skein books and came upon the Indian Cross Scarf by Marci Richardson. I threw in a few extra spacer rows between the crossover rows (it is similar to the dream swatch pattern, just knit longways. It was a quick and fun knit. And I love the Wexford Merino Silk yarn.